This popular moving-on tour, with full vehicle support, uses mid-range/good hotels and guesthouses. It takes in the highlights of Kerala: Kovalam Beach, Cape Cormoran, the hill stations in the Western Ghats, the Cardamom Hills, the inland waterways and Cochin on the Malabar Coast. In Tamil Nadu see the famous temple in Madurai, a World Heritage site, and the pilgrim town of Palani. On most cycling days much of the day will be spent riding, but there are some days with little or no cycling and lots of interesting sightseeing. Arrive at Ambadi Guesthouse, Trivandrum, by 11:00. Assemble bikes, short local ride then short vehicle transfer to/from Kovalam Beach. Stay 1 night. Cycle through pepper and rubber plantations to Chittar Lake at the foot of the Western Ghats. Afternoon free to explore or enjoy the infinity pool. 41km. Stay 1 night. Cycle to Kanyakumari (Cape Cormoran) via west coast fishing villages. Explore the Cape sea front, holy meeting of three oceans and view the sunset over the Arabian Sea. 70km. Stay 1 night. Short vehicle transfer to Nagarcoil for the train to Madurai. Afternoon visit on foot to the magnificent Meenakshi Temple and local markets. Stay 1 night. Vehicle transfer to Batalagundu. Cycle through jungle and tribal villages to Thandikudi (1,200m) in the Western Ghats. 39km. Stay 1 night. Cycle to Kodaikanal (2,000m), a steady climb with views. 41km. Stay 2 nights. Free day to explore Kodaikanal, the lake, botanical gardens and Coaker’s Walk. Cycle lots of downhill to Palani, a pilgrim town. Optional guided temple tour. 60km. Stay 1 night. Cycle to Munnar via sugar cane plantations and a crocodile sanctuary. 30km. Vehicle transfer through the Indira Gandhi Tiger Reserve and the Chinnar National Park then cycle through a sandalwood forest, coffee and tea plantations. 54km. Stay 2 nights. Free day to explore Munnar and visit the Tea Museum, or out and back ride to Top Station, 72km. Cycle to Kumily, in the Periyar National Park, through the Cardamom Hills. 84km. Stay 2 nights. Rest day. Guided tour of the spice plantations and walk to the elephant camp for an elephant ride. Afternoon at leisure to explore or enjoy a rejuvenating ayurvedic massage. 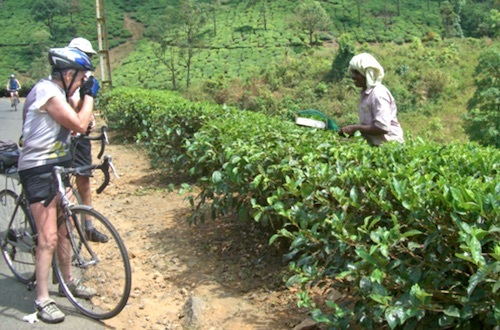 Cycle through tea plantations with a long descent from the Western Ghats. 84km. Vehicle transfer to the Backwaters. Stay 2 nights. Cycle to/from Alappuzha for a leisurely houseboat cruise of the beautiful inland waterways, one of Kerala’s highlights. 50km. Cycle to Fort Cochin, on the Malabar Coast, through shady coconut palms and sleepy fishing villages, prawn farms and rice paddies, with an opportunity for a dip in the Arabian Sea. 60km. Stay 2 nights. Free day to explore Cochin, the Dutch Palace, spice warehouses and antique shops. Afternoon at leisure and prepare bikes for the return journey. Rooms will be in mid-range/good hotels and guesthouses, equivalent to 2- and 3-star, with air conditioning or ceiling fan and ensuite facilities. All rooms are based on two people sharing. Breakfasts and evening meals will be taken at the hotels/guesthouses. Vegetarian and fish options are usually available. On moving-on days the support crew will provide light lunches and mineral water to be paid for from a kitty. Luggage will be transferred, and there will be sufficient space to assist riders if necessary. EU citizens must hold a passport with at least six months validity remaining at the end of the tour. A Visa is required, and you are responsible for completing your own visa application. There are no compulsory vaccinations for foreign visitors although it is strongly recommended that you be vaccinated against Typhoid, Tetanus, Polio and Hepatitis A and B. You should contact your doctor at least 3 months prior to travel to obtain these vaccinations and the latest advice to travellers. Our Booking Conditions stipulate that, for holidays outside the UK, travel Insurance is mandatory. Details of the level of cover needed and other conditions you should check are stated in our Booking Conditions. CTC Cycling Holidays & Tours Ltd cannot accept responsibility for any costs that may be incurred due to insufficient insurance cover. The price of £2,250 is based on a minimum number of 10 people taking part in the tour and is calculated at a rate of 88.2 Rupees to £1 sterling (based on exchange rates published in the national press on 2 January 2019; please note Booking Conditions, clause 3). If there are insufficient bookings by 29th November 2019, we will contact you and return all monies paid, although in certain circumstances the tour may still run at below minimum numbers but at the same price. A deposit of £400 per person is payable upon booking, with the final balance of £1,850 per person is to be paid ten weeks prior to departure, by 29th November 2019. Kerala is India’s most southerly state and the country’s most developed region, and as such it is an ideal introduction to Asia. Standards of literacy, education, health and hygiene are high compared to the rest of India. English is widely spoken, and the tourist infrastructure is well established. However, road surfaces are sometimes poorly maintained. It is diverse in flora, fauna and physical geography, due mainly to the considerable changes in elevation, from the narrow coastal plain at sea level with its unique network of tropical lagoons and canals, to the cooler high country in the north where conditions are ideal for the cultivation of coffee, tea and exotic spices. This tour is suitable for experienced cyclists capable of distances up to 85 kilometres and cycling on consecutive days. There are, however, rest days and half days, and support vehicles will be with us for the duration of the tour. The terrain is hilly in the Western Ghats, but the climbs are well graded. On riding days an early start will be made to allow cooler conditions for most of the ride. It is not practical, or enjoyable, to ride together as one group. The navigation is straightforward, so you may cycle at your own pace and stop for photographs etc. The drivers will indicate if you need to accept a vehicle transfer to reach designated refreshment stops or destinations. In theory, traffic drives on the left, though in practice in built up areas it is chaotic. In busy areas cycle single file and well-spaced, allowing room to manoeuvre. Organised sightseeing to places of interest is included in the cost of the tour, and there are extra options on some days. You are, though, free to do your own thing if you wish. In mid-range/good hotels and guesthouses, with air conditioning or ceiling fan and ensuite facilities. South Indian food is mainly vegetarian and spicy but not hot curry. There is an abundance of fresh fruit and fish. Mineral water is widely available and will be carried on the support vehicle, to be paid for from the kitty. There is no travel included in this tour, thus it is very important that you note that neither your Tour Manager nor CTC Cycling Holidays & Tours are responsible for you in any way until the appointed time at the designated meeting point. Should you fail to arrive at the appointed time for whatever reason, we will not be responsible for any additional expenses you may incur in order to meet up with the tour group. Before finalising travel arrangements to meet the tour, you should ensure that you have read and understood our booking conditions. Should this tour not attract sufficient bookings to reach the minimum operating size, we may cancel the tour at any time up to 10 weeks before departure. It is therefore recommended that you book fully flexible and refundable transport and accommodation or wait until you have been informed that the tour is going ahead, as in the event of the tour being cancelled, we will not be responsible for any losses incurred. The maximum number of participants will be 17 excluding the Tour Manager, plus local guides who have worked for CTC Cycling Holidays & Tours for 19 years. It will be hot and dry with daytime temperatures up to 32°C. Sun cream is very strongly recommended. Head and eye protection are also essential. A light windproof/fleece might be needed in the evenings when visiting hill stations and for early morning descents. Modesty is expected in towns and temples. Ladies should cover their legs and shoulders when not cycling (a beach wrap is ideal for this; knee-length cycling shorts are also useful). Most roads in Kerala are in reasonable condition. A lightweight mountain or touring bike will be suitable so long as you are able to carry a daypack or rackpack. Equipment must be in good condition as spare parts will not be readily available, so ensure your bike is in good order, paying particular attention to wheels, tyres and brakes. Use good quality touring tyres, at least 28mm and preferably 32mm. Each participant will be expected to carry sufficient spares and tools to deal with punctures and minor repairs. An accurately calibrated cycle computer or GPS device is advisable. Maps of Kerala are available from all good map shops. Some of the minor roads we use will not be shown. You will be provided with gpx tracks, route sheets and/or sketch maps, and be guided by the drivers. Before booking you should check the latest travel advice from the Foreign & Commonwealth Office including security and local laws, plus passport and visa information, at www.gov.uk/foreign-travel-advice.